A spider web tattoo is a beautiful body marking that demonstrates one of the most sophisticated things created by an animal. As adorable as this tattoo might look, it is one of those that you can be certain will draw a lot of controversies. Unlike other types of body art, everybody will want to know why you have it and what it symbolizes. All this is because of its origins and the perception that most people have with this totem. A few years back the spider web was a body marking that gang members would have as a sign of allegiance to their gang. It was a very famous totem in Central and South American prisons because inmates would use it to show their loyalty and for protection when behind bars. And so even when they were out after their sentences most people would still know that they are ex-cons. 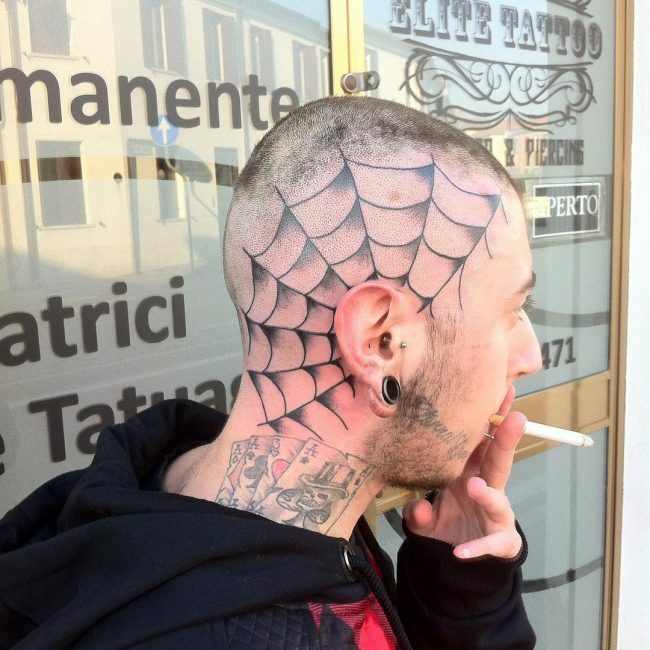 To avoid being perceived as an ex-convict, most tattoo lovers would prefer not to have the web. However, this has been changing gradually over the years as more and more people accept that anyone can have the web to symbolize many other things and not as a sign that you are in a gang. This acceptance has brought about numerous design variations, and there are now endless web tattoo types that you can have. 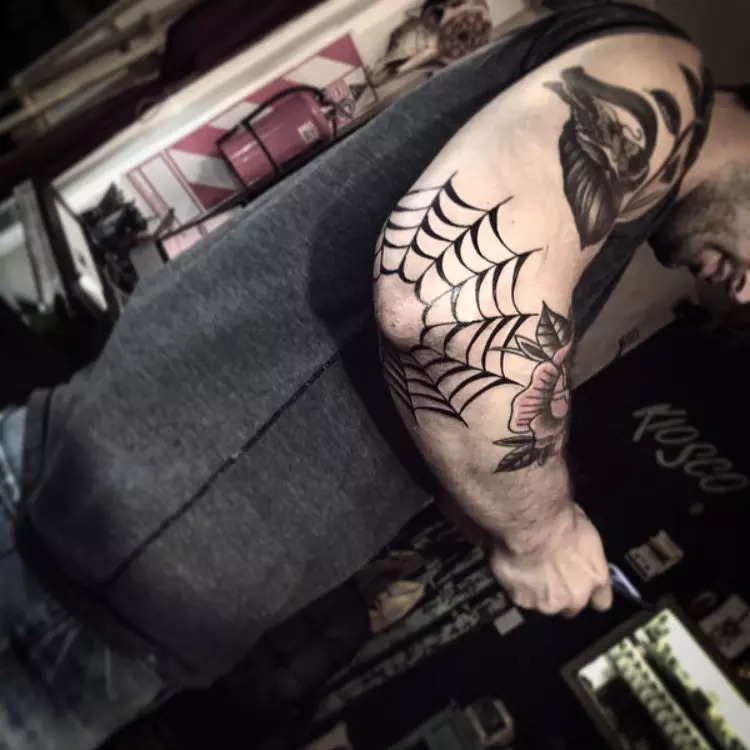 What Does a Spider Web Tattoo Men /Symbolize? Times are always changing and so the original meaning of the spider web has also changed. However, it is important to understand what this totem used to mean a few years ago and what it means in these modern times. In the old days, the web was a favorite symbol for inmates who were in for many years. The inmates would have the tattoo to show that they will be in for a long time, and they started it off as a small web and would add one strand to represent each year they were behind bars. Most others would also have it to show their allegiance and loyalty to certain prison gangs. For gangs, each ring on their web would represent a murder or crime that they committed. 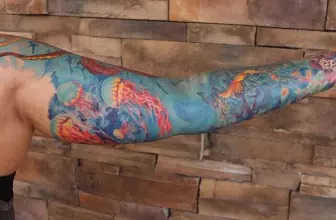 Just like most other modern tattoos the web does not have to mean anything, and so you should not worry about all the negative symbolisms of the past, and you can have it because you like the pattern. However, there are still some meanings that tattoo enthusiasts will associate with the cobweb. Struggles are one of the main ones, and this is more so if the web also includes a trapped insect. You can use the tattoo to symbolize your struggles with different things in life such as alcoholism. For others, it can mean that they are in a situation that they are not comfortable with but have a hard time coming out it. Sailors will also have this tattoo to show that they are longing for home, or they have been leaning on the side of their boat for so long, and now a spider has formed a cobweb on their elbows. Biker gangs also like having the web tattoo and for them, it symbolizes the “web of fate” meaning that one caught in a “destiny” that life has chosen for them, and there is no way out. Other meanings that you can associate with the web include intelligence because a spider requires it to build it and hard times. 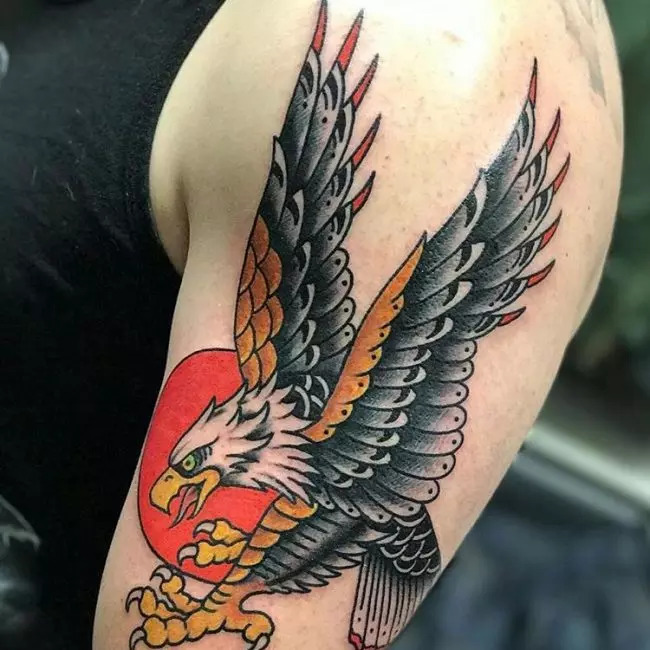 Tattoos are always evolving and new design variations coming up, and so it is not possible to know how many design variations of a particular symbol are out there. The same also applies for the spider web tattoo, but some specific types are more popular or widespread than others. These design variations include the following. You can also make your cobweb look realistic by having it in 3D. 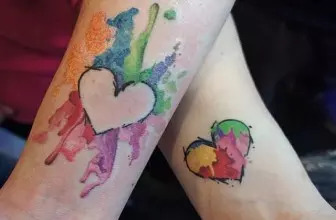 This design is very popular with modern tattoo lovers, and most will prefer to give it some bright colors instead of having it in the traditional black ink. Some will also include a 3D spider in the web to make their body marking look stunning. A skull always makes a fantastic tattoo addition, and you can combine it with almost any type of totem that you want. It is quite common for people to add a skull at the center of the web as this helps to make the design attractive. You can also spice up this design by drawing the web that wraps around a realistic looking skull. Combining the two also makes your totem very symbolic. 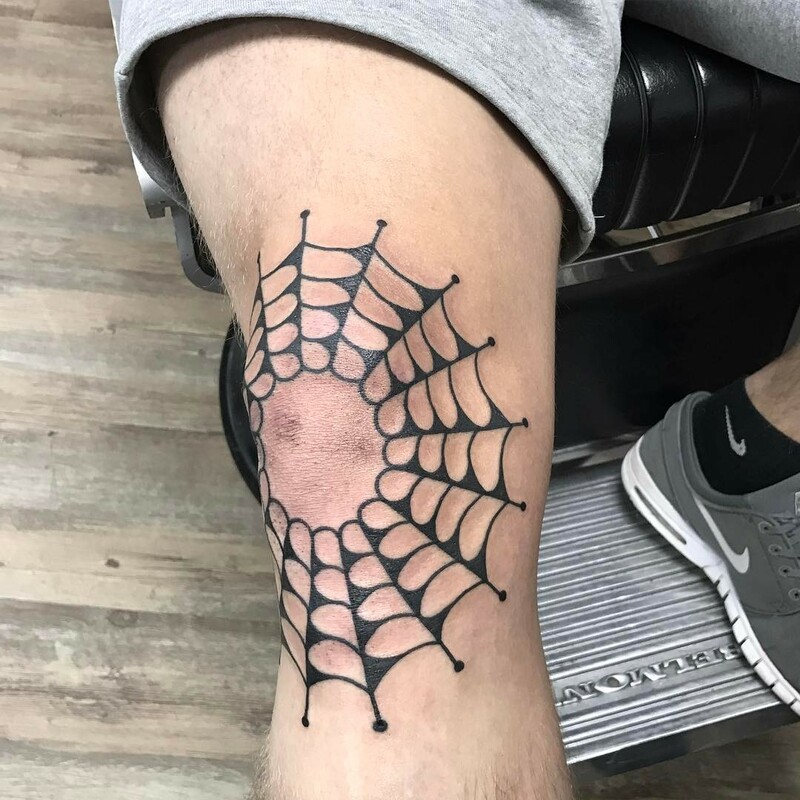 The vintage web is one of the most popular variations of this tattoo, and this is because it has a very distinct appearance. It is a straightforward web design with numerous rings but its vintage appearance is what makes it unique. The vintage look will require a creative choice of color to create and so you have to ensure that you use the services of a skilled artist to get it. 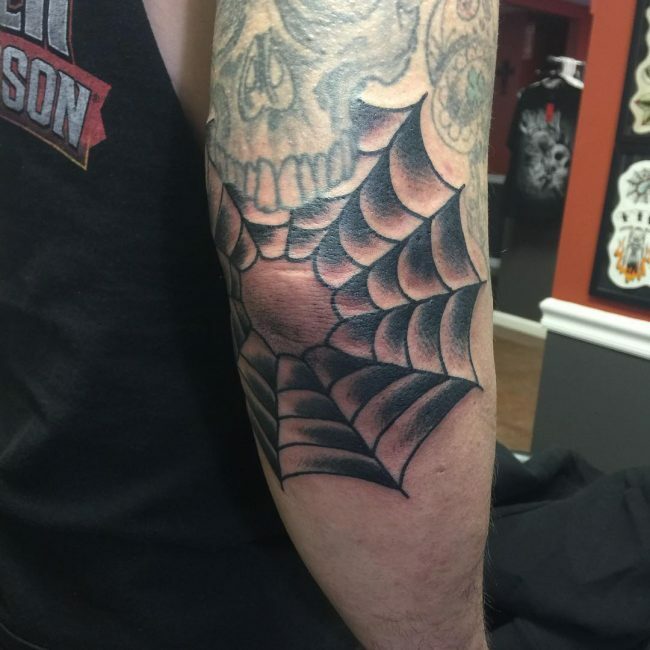 Most people prefer to have their spider web tattoo on the elbow because it is more symbolic in this location. Even gang members and inmates who were the first people to have this totem would prefer to have it on their elbows. However, there are still many other places that you can have this totem depending on its design and size. Whereas some prefer to have large ones on the chest or back the upper arm and back of the leg are perfect for others. It is also common to see other people with small webs at the back of the ear or wrist. A few individuals will also have their cobweb on a bald head or even on the palm. 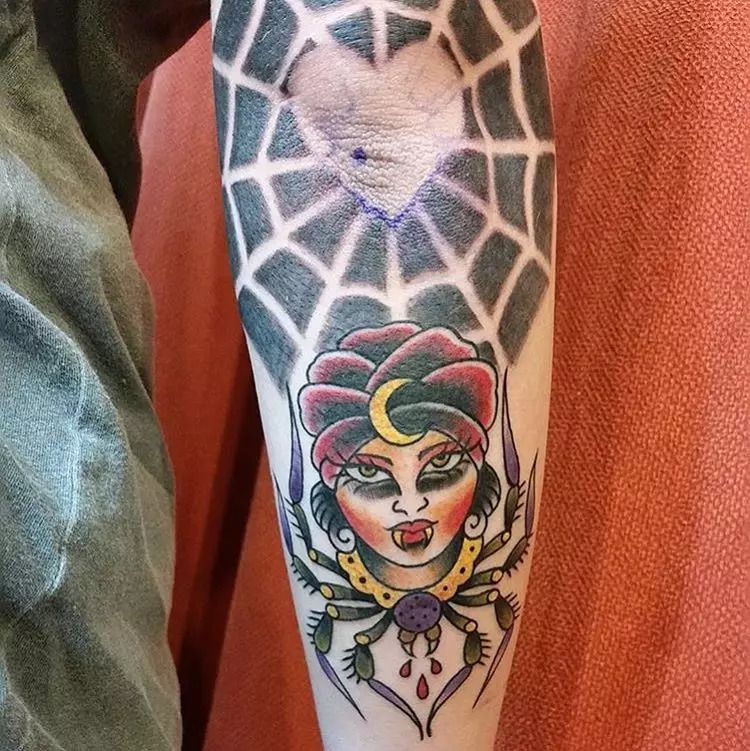 A spider web tattoo is a beautiful totem that anybody that wants something symbolic and unique should have. Although some people still perceive it negatively, it has many other positive meanings. Just like any other body marking, the most important thing is what it means to you and not what other people think about it.